TWINS RUN in our family: Do You Race Too Much? It's been 30 days since the Charlottesville Marathon and I haven't quite taken a break from racing. In fact, I've run four 5Ks and a half marathon in the past 3 weeks. 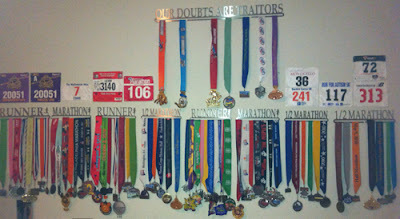 Probably not the wisest idea, but I'm a race addict! 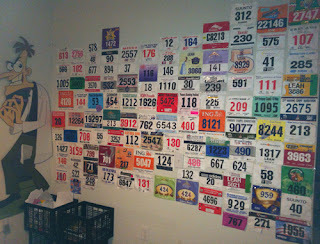 If I have the opportunity to earn a medal or get a bib to post on my wall, I'm there! Oh wait, I forgot, I also ran/walked a 4K with my daughter, Annalivia Plurabelle, in matching purple Team Sparkle skirts. So that's 6 races in 3 weeks. Oh my! I know I won't and can't PR in ever race, but I'd still prefer running more races even if it means I might not always be at my best. I've learned that some events are more about the experience (Montalto) than the finish time. Sometimes I look at a race as a speed workout or a fun run. No matter what, I love the community and the competition. I love having the opportunity to interact and connect with other runners. Working from home is a very solitude affair, which is perfect for me to be productive, but it also means most days the only adults I speak with in person are the starbucks barista and gym lifeguard. The local not-for-profit race is a great opportunity to do good for the community as well as be an active member of it. Oh, and then there is the excitement of winning an age group award or grab bag prize! If I counted all the swag I've collected and distributed to friends and family over the past 4 years, it would be quite a haul! The Fourth Annual Pi Miler was a week after the marathon, and I was definitely not recovered. I ended up walking up a huge hill, but somehow still managed to be the first female community member to cross the finish line (ok, there probably was only one other person in my category!). I scored a Ragged Mountain Running Shop sweatshirt and was thrilled when I went to redeem my certificate to see they now carry them in navy blue! Whoo hoo!). The following week I ran 2 more 5Ks. The Run for Autism 5K on Saturday and Darden Cares 5K on Sunday. I came in 2nd in my age group at the VIA 5K and improved on my time from the previous year. Unlike Lopez Lomong who miscounted the number of laps, thinking he was finished when he actually had one lap to go, I actually thought I had to finish the race with a lap around the track, so when I saw the finish line banner appear before the track, it came as a huge surprise. So much for for hammering out a super fast 400M as I had mentally prepared myself to do! Oh well! The next day I ran a smaller 5K on the UVA campus and I had so much fun! There was no pressure to perform well since I had just raced the day before and I didn't know anyone running so I felt anonymous. I enjoyed racing fast and the game of getting passed, but then passing those same people with less than .5 mile to go. It was so exciting to see 21:31 on the clock (a PR by 10 seconds), but my garmin said it wasn't quite 5K, so I'm not sure I'll count that. Actually the 21:41 was also on a questionably short course too, so maybe I'll stick with 22:06 as my 5K PR (that course was exactly 3.1 on my watch!). Last weekend, I ran the Park to Park Half Marathon and it was a nightmare. I woke up with an upset stomach and ran the entire race feeling both sharp stomach pains and nauseous. I just wanted it to be over! I didn't enjoy the experience at all, except for the last 200M when I decided I had to pass a couple on my left and prevent myself from getting passed on the right. I later found out that someone from my local gym was trying to catch me, but didn't. PHEW! My time wasn't bad (1:45:19, but it was more than 4 minutes slower than my course PR last year, 1:41:02). I think I would have preferred a slower time if I could have enjoyed the experience more. I know have a deeper appreciation for feeling healthy and a deeper understanding of the physical struggles my twin deals with on a daily basis. I felt sick for nearly 4 days and was a miserable mess. I don't know how Malinda does all she does with her gastroparesis. I'm in awe of her. Yesterday I ran the Montalto Challenge - an all uphill race on the beautiful grounds of Monticello. I've accomplished so much so far this year, my coach told me a couple weeks ago that I could stop right now and still have the best year of my life... not that he's suggesting that I do that, or that he believes I actually could (remember, I'm a race addict!). Even though I'm so grateful for all my running success, it still stings a little when I don't do as well in a race as I had hoped. Luckily, I'm getting much better at not dwelling* on any bad days, but there's still room for improvement. *For more information, read Traits of Successful Runners by Greg McMillan. 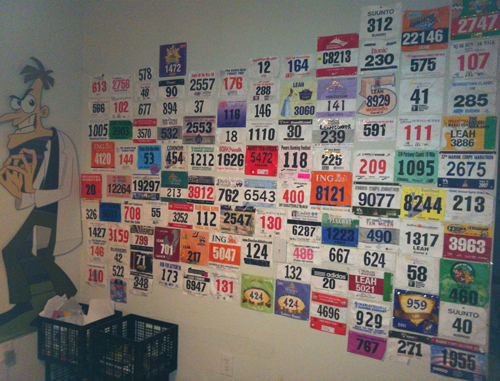 Total race addict. I'll use races as training runs... I know I'm not the only one that does that either... Great post, great share and super fun photos. Keep running (and racing) strong!